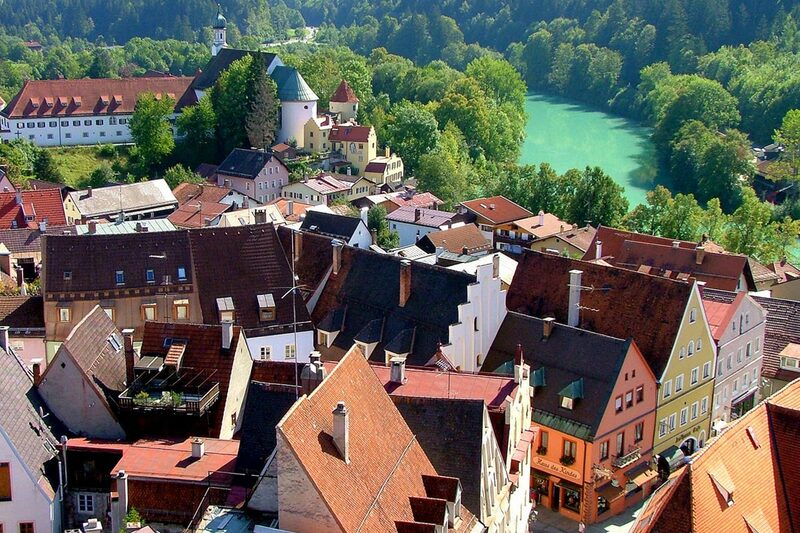 The picturesque town of Füssen, situated beside "Romantische Straße" tourist route on the edge of the mountains ranges of the Algovian Alps and the Ammergau Alps at a height of 800 metres, is an ideal starting point for cultural excursions, nature experiences and outdoor activities. The romantic town is also well-known for its vicinity to the world-famous "Neuschwanstein" Castle and "Hohenschwangau" Castle, which are outstanding visitor attractions in Algovia. Holidaymakers and visitors should not miss a visit of both castles during their stay. The guests who are interested in history can immerse themselves in the 700-year history of the town by visiting the museum housed in "Hohes Schloss" Castle. Nestling in the marvellous landscape, the villages of Bad Faulenbach, Hopfen am See and Weißensee, which are part of the town of Füssen, are also worth a visit. 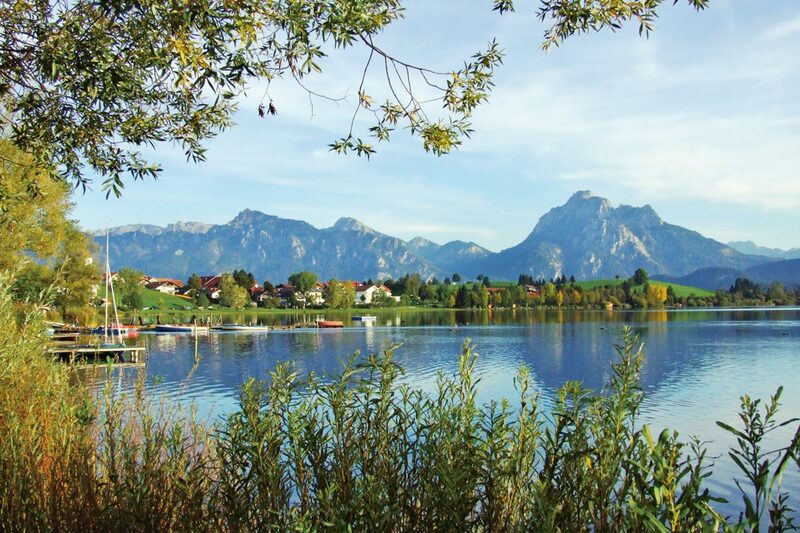 Bad Faulenbach - "The valley of the senses"
The idyllic village of Bad Faulenbach is encircled by six lakes which provide amazing nature experiences. The guests can unwind and explore the fabulous countryside taking a leisurely walk both in summer and in winter. Near the resort of Bad Faulenbach there is the mysterious "Alatsee" tarn where you can get having a walk of about one hour on a gently climbing footpath. In summer, the idyllic "Mittersee" and "Obersee" lakes are an ideal destination for a relaxing family day out to enjoy swimming and splashing around. Bad Faulenbach has been a spa since the Roman era. Specialising in hydrotherapy and mud baths, the health resort offers excellent facilities for the successful treatment and alleviation of rheumatic troubles, gynaecological disorders, urologic diseases as well as dermatological problems, metabolic disorders and connective tissue diseases. Hopfen am See - The "Algovian Riviera"
Given its romantic location and the views of impressive Alpine mountains, the resort of "Hopfen am See" is a marvellous place for restful holidays, especially for families with children. There are shallow beaches along the lakeshore where you can relax, enjoy the sunshine, swim and splash around. 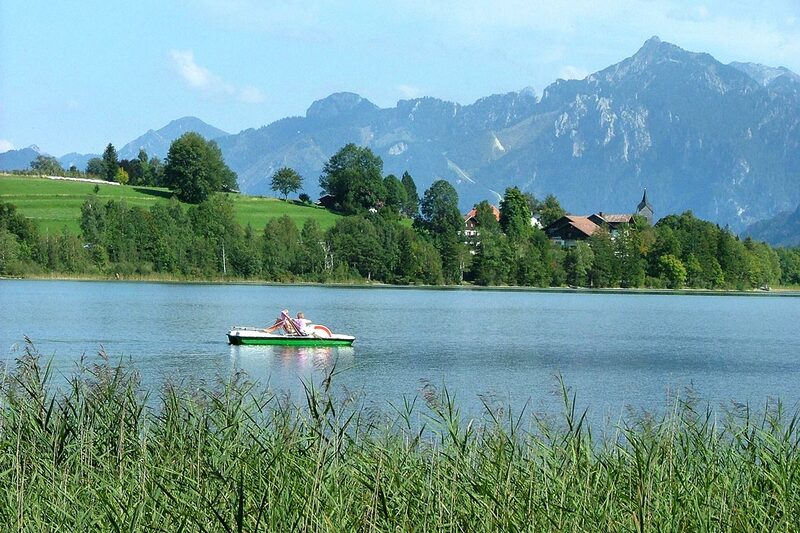 You can also enjoy a leisurely cruise on the lake with a pedalo, rowing boat and or sailing boat. The village of "Hopfen am See" is an officially recognised climatic and hydrotherapy resort, being well-known all over Germany for its spa hotels and therapy centres, such as the renowned "Enzensberg" Clinic, specialising in acute care and rehabilitation medicine. The village of Weißensee is a climatic resort, nestling in an idyllic scenery and offering views of the Algovian mountains. 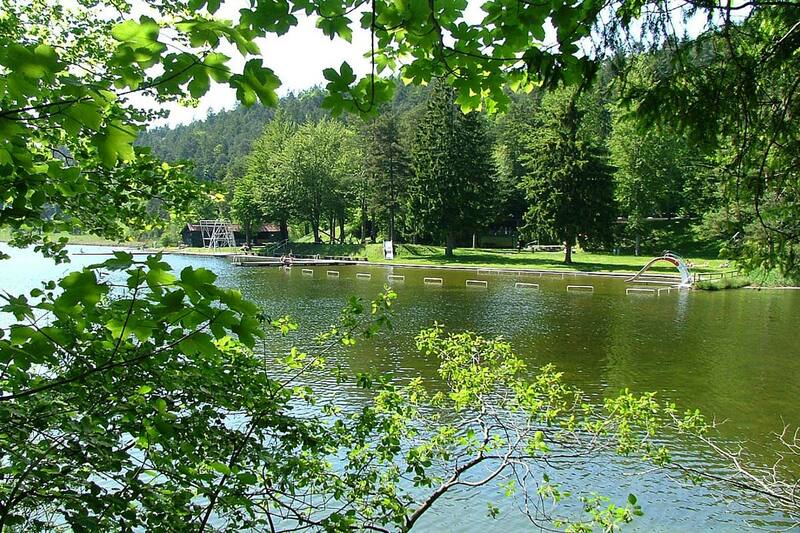 The romantic homonymous lake is surrounded by the picturesque countryside of the Alpine foothills. Its lakeshore can be accessed by the public everywhere. The resort is recommended by the German Automobile Club (ADAC) especially for family holidays. Weißensee provides best facilities for families with children. In summer the shallow beaches and the pleasant water temperatures ensure enjoyable holidays. In the leisure centre with swimming pool and children’s playground "boredom" is an unknown word. In winter there are snow-cleared footpaths, 40 kilometres of cross-country skiing trails, running through the beautiful natural countryside, as well as ski slopes within a distance of only 10 kilometres. You can also practise ice-skating and curling on the frozen lake and afterwards you may taste a fine grog in a cosy inn.